I have a Lennox G40UH(X) series furnace, which is installed in our attic (We have a single-story house on a slab). Because the furnace is installed in the attic, it is "laying down" on its side, and the incoming air is piped into what would be the bottom of the unit if it was standing up. We have intake vents in almost every room of the house (small vents, about 12" long by 8" tall). These vents go up to the attic, and they're all routed into a big metal box which is appears to be welded to the bottom of the furnace. I have flexible ducts leading to the cold air intake "box" that is welded to the bottom of the furnace, and round flexible ducts leading from the hot air "box" to all of our vents (which are in the ceiling). The problem I am having is that I can't see where to install a filter! I can remove the front panel and see the bottom motor, but there's no where to actually put a filter. I don't have any idea what a "field-provided filter" is. When we bought the house, there were a few destroyed filters in the attic next to the furnace (all of different sizes, a few cut to different sizes, but no filter in the furnace. It looks like the previous owners had no idea either. So, for now, we've just been running the furnace without any filter. Is there something I can do to put a filter in? Is it really harmful to run the furnace without one? Should I look into putting filters in all of my little air intakes around the house? Update: As is usually the case with me, I put off worrying about the furnace until it started getting too cold here at night. I finally climbed up to the attic and took a good look at the furnace. There isn't any indication of where a filter should go, and no slot to slide it in or bar to hold it in place. I have the same filter location as referenced by Steve Armstrong. There is no slot for the filter but it is just held in place over the return duct by a metal arm. I would not have known a filter was supposed to go there if there hadn't been one there already. Usually the filter is mounted between all the return ducting and the furnace itself - potentially it is installed at a strange angle or covered up with tape or something. Here is a picture of mine, it's the darker colored piece the duct is attached to, with foil tape sealing it to the furnace housing. I don't know if this is common or not, but in our current house and our previous house, the filter is in the return vent inside the house. 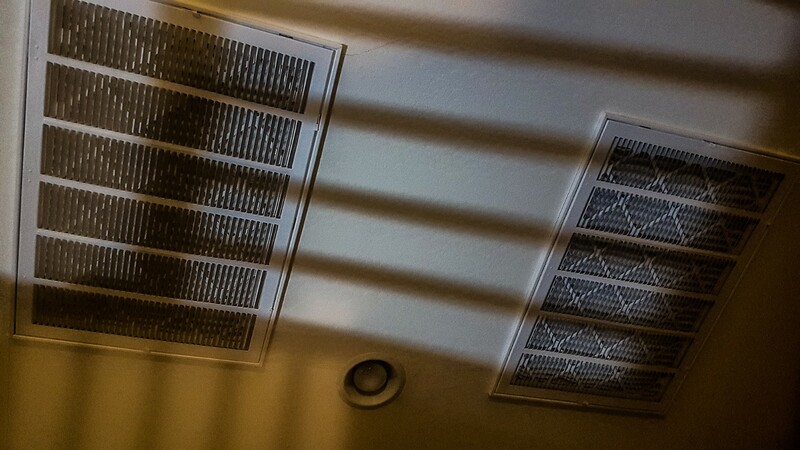 The vent grate has two little latches that allow it to swing out of the way, revealing the filter. To check if yours is like this, just look for the latches and/or look through the vent slots and see if you see a filter. Edit: I should have read your post a little more carefully, I didn't notice you mentioned "all my little air intakes." So clearly you don't have just one return vent that could be housing a filter. At any rate, if a filter were present it would have to be between the return box at the left of your diagram and the unit itself. The installer should have built a gap in there to accept a filter, just like in gregmac's photo (but preferably this would be a slot rather than needing to be taped in!). If you're not seeing something like this I'd recommend modifying it, or having someone do it if you're not comfortable doing it. Sounds like the unit doesn't hold the filter. It must be custom installed right between the return duct and the unit. You'd think the hvac guy would leave some kind of access panel. Mine is just like @gregmac's picture, except I can get at the filter on the opposite side via the blower access panel. Your going to circulate a lot of dust without a filter. At my old house, there wasn't a slot to put the filter into. Taking the door off the side showed me the motor, like you've said, which was situated inside the cold air return chamber (much like your picture). The filter rested on two notches on the outer edge of the chamber, and basically blocked my view of the motor. See if there's a way to place the filter "in the way" of the cold air as it passes the motor. This disgusting image shows how the door opens to reveal the motor, and the air filter is placed at an angle in the way of the motor. Air flows from above and hits the angled filter. This unit is not equipped with a filter or rack. All G40UH(X) filters are installed external to the unit. 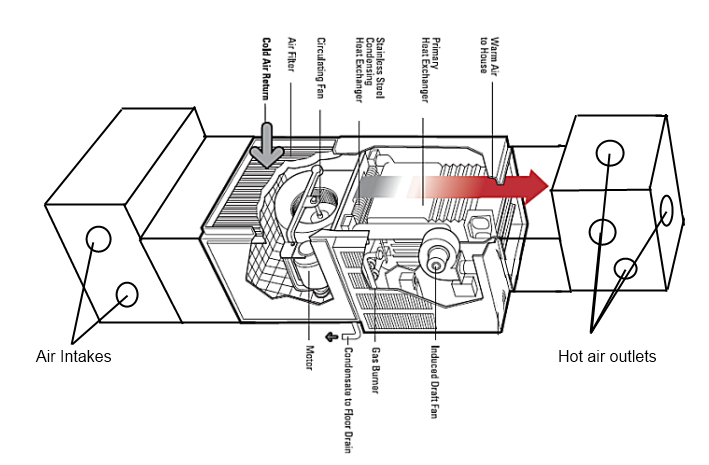 If furnace is located in the basement then filter is placed at furnace between intake ducts and blower motor. If furnace is located in the attic then filter is placed at intake ceiling vents. If none of the above, then stick one any size that can fit in between intake ductwork and blower motor. You need to install a return air grill designed to have an air filter installed. This is much more convenient and more likely to get changed as a result. The placement of a filter in the unit in an attic is not a wise choice. It sounds to me like the 'return vents' are actually exhaust vents from the heater. My attic heater has a return duct directly below the heater at floor level in the living room. The filter is in front of this return duct (20" X 30" filter). 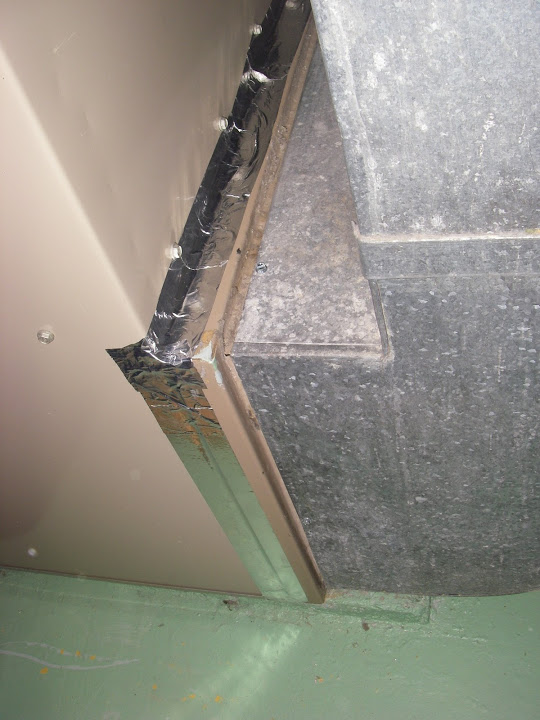 There should be a rather large flange on the bottom or side of your heater for the return duct to attach. It sounds like your heater is sucking in cold air from the attic and heating it instead of sucking in the already heated air in your house for recirculation. An expensive way to heat a house. All G40UH(X) filters are installed external to the unit. 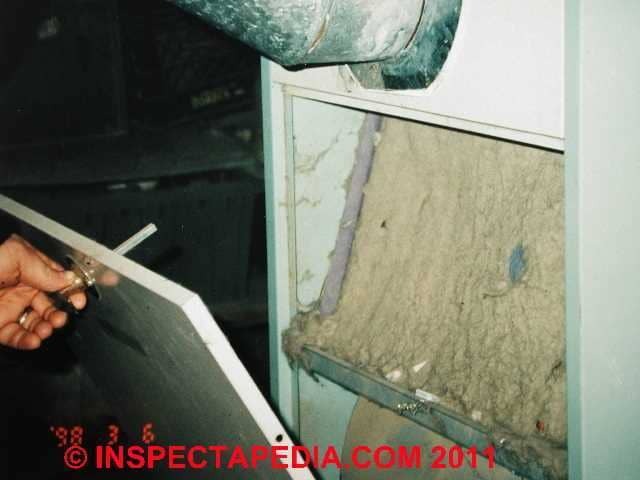 Filters should be inspected monthly. 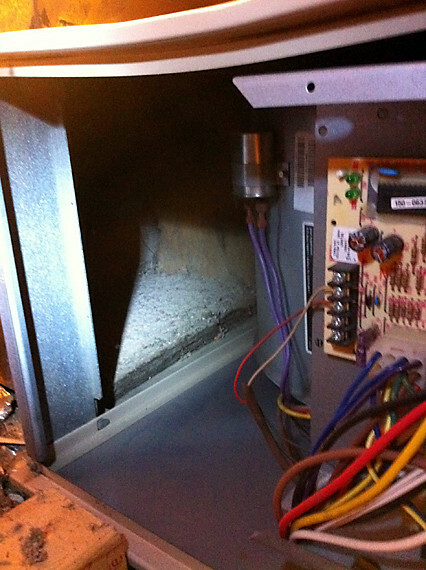 Clean or replace the filters when necessary to ensure proper furnace operation. Replacement filters must be rated for high velocity airflow. Table 1 lists recommended filter sizes. Not the answer you're looking for? 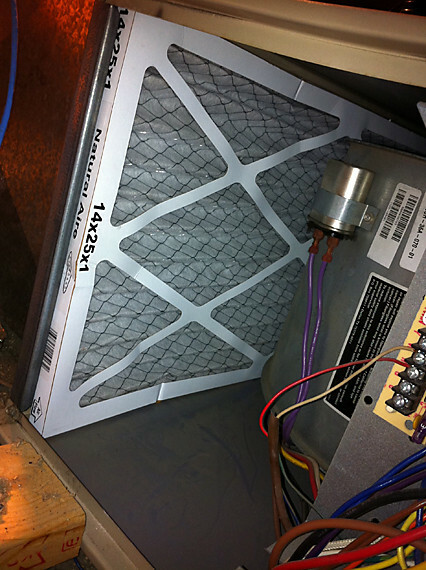 Browse other questions tagged hvac furnace attic air-filter lennox or ask your own question. How can I reclaim heat from an enclosed furnace room? How can I determine what size and type of filter is required in my air handler? Replace or wash this furnace filter? Where is the pilot light on my Carrier Infinity Series 48XT dual fuel hybrid furnace/Air Conditioner? Do cold air return vents also supply combustion air?